Who Is Winning The Decentralized Exchange Race? Decentralized exchanges (DEXs) are often touted as exchanges of the future. Some of the benefits of decentralized exchanges are the absence of a third-party or intermediary, anonymity, potentially lower fees, and more. Some of the disadvantages of decentralized exchanges are the lack of liquidity and difficulty to use. Let’s take a closer look at the decentralized exchange landscape to better understand the market leaders and trends. The data in this article was pulled at 11:30 PM EST on Oct. 22, 2018. Over the past 24 hours, IDEX had the highest amount of volume for a decentralized exchange world with 22,058 ETH or $4,477,774 traded on the platform. DDEX had the second most volume in the past 24 hours for a decentralized exchange with 4,262 ETH or $865,186 traded. Bancor came in third place in 24-hour volume with 4,070 ETH or $826,210 traded. 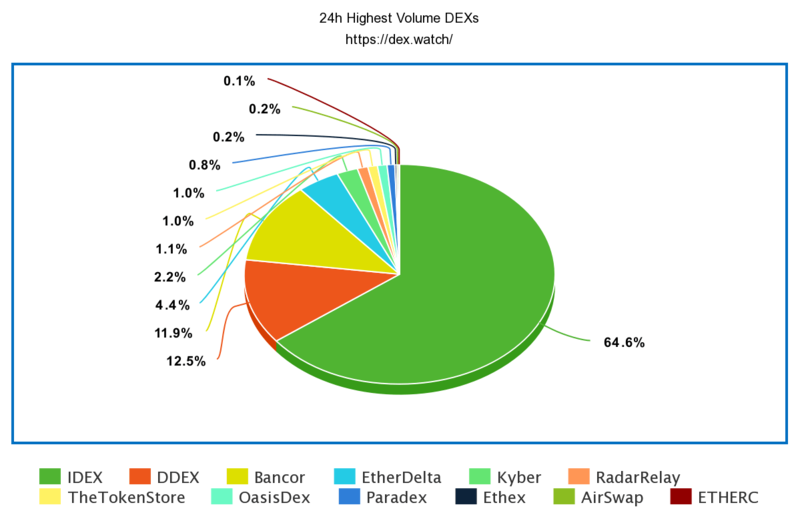 The top three decentralized exchanges, IDEX, DDEX, and Bancor, made up 89 percent of decentralized exchange volume over the past 24 hours. Data pulled from DEXWatch on 10/22/2018 at 11:30 PM EST. While the top three decentralized exchanges made up a significant portion of the DEX market trading over the past 24 hours, the top three centralized exchanges traded nearly $2.5 billion over the past 24 hours. Of the top three centralized exchanges and top three decentralized exchanges, DEXs made up just 0.25 percent of the volume. Needless to say, centralized exchanges still dominate the market and will for some time until there is more trust in decentralized exchanges. 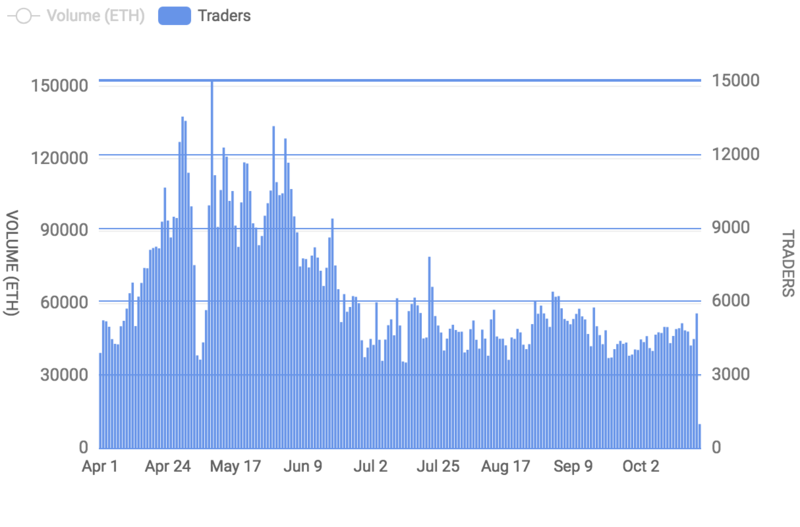 Since April, decentralized exchange volume has been quite volatile. Over the past six months, 24-hour decentralized exchange volume peaked on May 9, 2018, at 152,946.32 ETH or $114,595,045 in the price of ETH at the time. Conversely, 24-hour decentralized exchange volume bottomed on Oct. 22, 2018, at 4,568.92 ETH or $927,490.76. 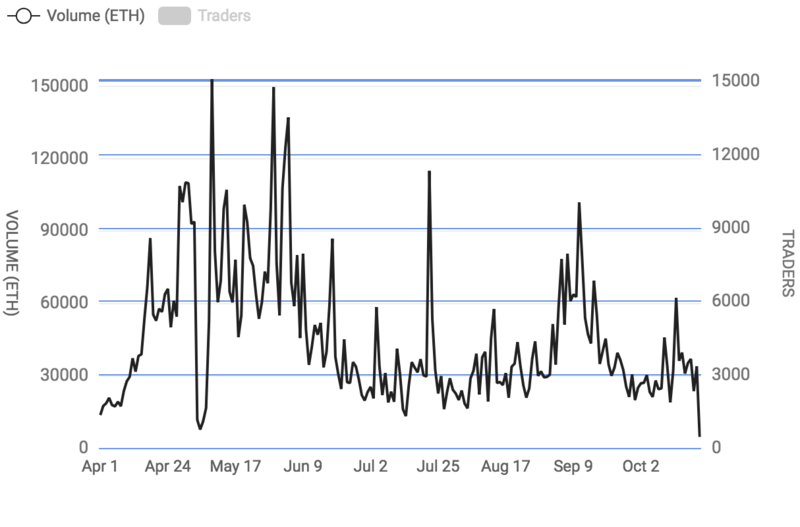 Since April, the number of traders on decentralized exchanges has also been extremely volatile. Over the past six months, 24-hour decentralized exchange volume peaked on May 9, 2018, at 150,090 traders. Conversely, 24-hour decentralized exchange volume bottomed on Oct. 22, 2018, at 977 traders. While decentralized exchanges have a long way to go, this concept is logical to those in the crypto space. Keep your eye out for decentralized exchanges stealing market share from centralized exchanges as the cryptoasset market continues to evolve. The post Who Is Winning The Decentralized Exchange Race? appeared first on CryptoSlate.